Tesla has been able to turn its manufacturing plants into some kind of attractions. The company offers regular tours of its Fremont factory for Tesla owners to see where their cars are coming from and it even pushed an “industrial tourism” bill that would have enabled out-of-state buyers to pick up their cars at the factory. Now, Tesla also plans to open up Gigafactory 1 in Nevada for regular tours. The company already conducted some planned tours of the plant last year to inaugurate the first phase and earlier this year for a select few people in the investment community, but otherwise, the plant has been mostly inaccessible to Tesla owners and their friends. As part of the latest round of the referral program, owners who referred one or more people to buy a Model S or Model X received access to a Gigafactory tour for themselves and up to 3 friends. Since that was the first level of prizes in the referral program, thousands of people likely won and thousands more should get to visit the Gigafactory in the coming months. 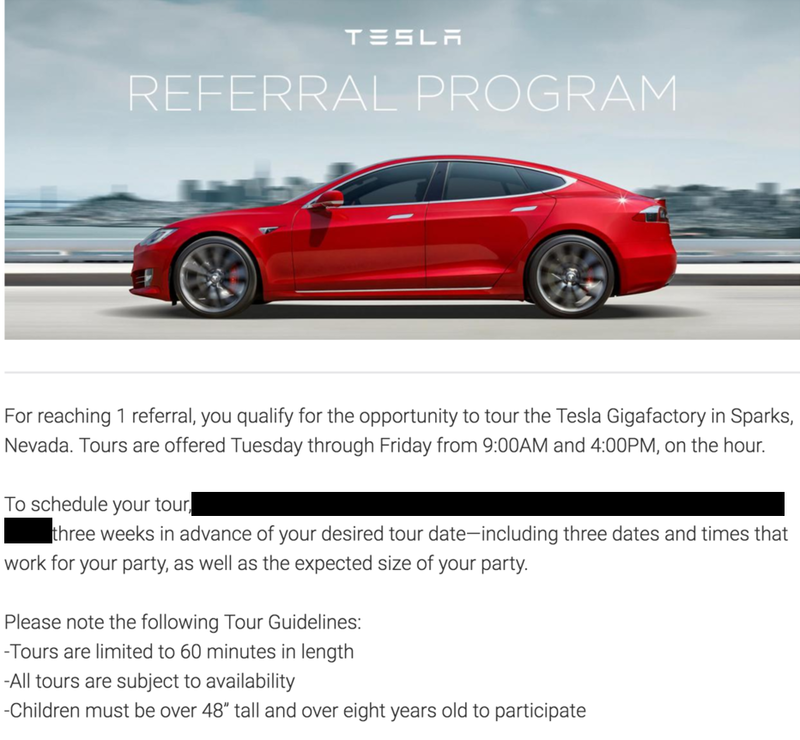 This week, Tesla started sending out more information to referral program winners about the tours – saying that they will be open Tuesday through Friday: The Gigafactory 1 changed a lot since it was last accessible to Tesla owners. They added a few sections and they have started production of Model 3 battery packs. As we recently reported, thousands of employees are now working at the battery factory. Interestingly, they are referring to the plant as the ‘Panasonic Gigafactory’. Tesla has always called it a ‘Tesla Gigafactory’ or ‘Gigafactory 1’. Panasonic has operations on the site and it is Tesla’s main partner in the project, but the automaker owns the land and manages the facility which in turn houses several suppliers like Panasonic. The 'Tesla Gigafactory' is a concept for a massive battery factory capable of producing the equivalent of the entire current world's production of li-ion batteries or about 105 GWh of capacity. Tesla plans to eventually operate several of these giant factories, but the first one - called 'Gigafactory 1' - is under construction in Sparks, Nevada (east of Reno).